Hot off the heels of webOS Doctor v1.3.1 being released, WebOS Repair Utility has been updated. Not only were there expected bugfixes, but there was a major shift in the way it handled webOS versioning, allowing the more devices, like the Pixi, and more device variations, like the GSM Pre and its webOS 1.1.3.
webOS is amazing, in that it's possible to patch and theme virtually any part to your liking. Unlike with other OSes, users don't have to install whole other programs to accomplish what patches can do. Patches and themes have quickly become a highpoint of the webOS. However as more new users take to making their own system modifications, more and more people make mistakes and need to restore files. A quick look across the forums will show many people in such situations. Unfortunately only official solution is lengthy and wipes all data on your device (thankfully, the 1.3.1 Doctor doesn't touch files on the media partition). WebOS Repair Utility gives an alternative, correcting only the damaged files and leaving all other data like homebrew apps and PIM data intact. 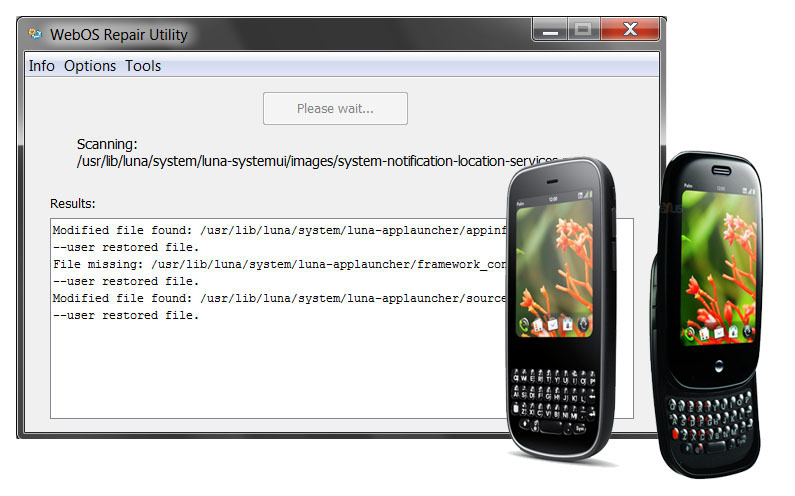 So if you're having such an issue, try WebOS Repair Utility before calling on the Doctor. Who knows, ya might save some time and frustration!